I received this technique in a swap from sweet SAer Kim Bolzenthal. 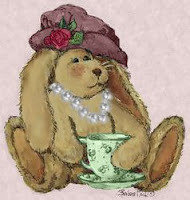 She credits pawsitivelyhappystampin.blogspot.com. We'll be making this card at October Technique class...it is a lot of fun! Put 1/2 cup of Epsom Salt in a hot tolerant bowl. Add 1/2 cup of boiling water and stir until the salt crystals are dissolved. 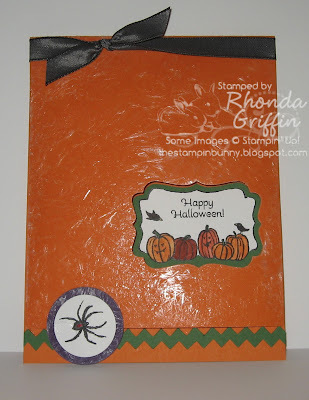 Use a paint brush to paint the entire surface of the cardstock and cover well. Do Not go back and try to add more after it begins to dry-it will ruin it. I think it is best to let it dry naturally and plan to make it the first thing we do at my upcoming technique class. We can then finish the card last of all. Be patient....and happy stamping! Consider trying it for a crystalized ice look too. 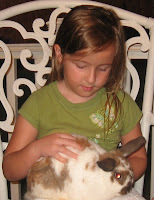 But....don't use Bashful Blue-it DID NOT work. Marina Mist worked though. 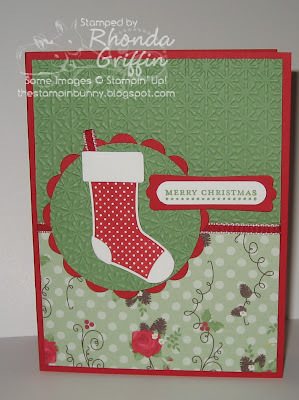 This card is fairly quick-it will even be one of the options for Stamp A Stack later this week, but I really enjoy this new dsp, Stitched Stockings stamp set and Stocking Builder Punch, so I thought I'd share. 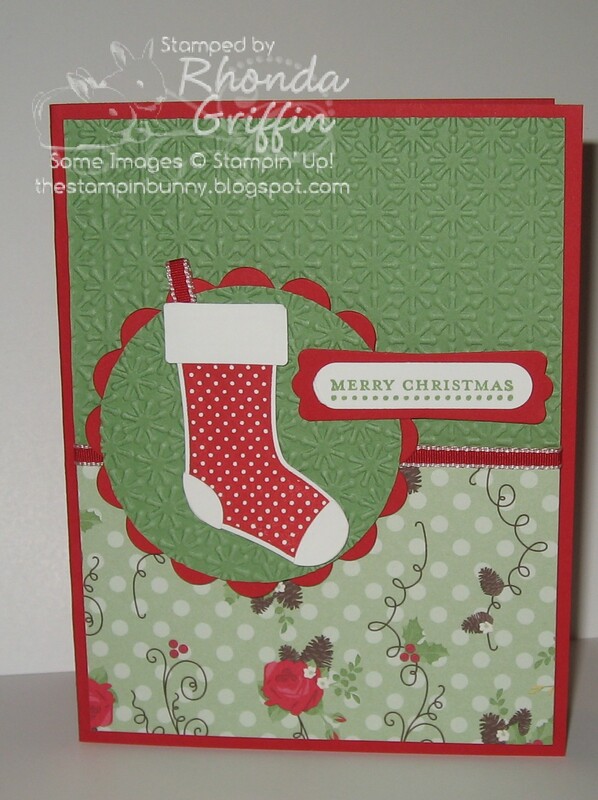 The Snow Burst Textured Impressions Embossing Folder makes a clean crisp card just a little more fun as well. Time for a Fall Card! 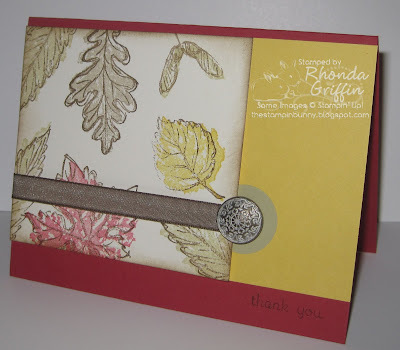 These loosely stamped 2-step leaves are from the Gently Falling set, and I used Stampin' Addicts Sketch Challenge 109 for the layout. We'll make this card at Quick Class on Thursday the 15th or Friday the 16th. I'm going to send this card to my 25 year old cousin who is undergoing chemotherapy for lymphoma...She's a sweet and brave girl! The inside says "to make it better". 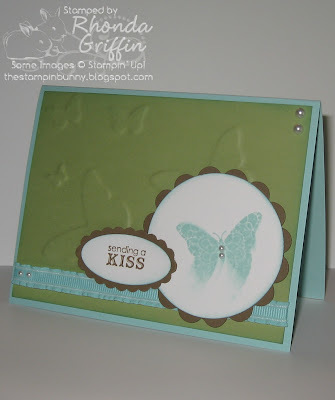 The sentiments are part of the Perfect Pairs set from Stampin' Up!. I find the entire set so useful, and it really fills in some of my imagined sayings needs. The streaking technique just involves dragging the stamp in the direction the stamped image has already traveled (figuratively) before lifting up the stamp. Easy, but different. The butterfly image is from the Creative Elements Stamp Set. I created my own embossed background of butterflies by stacking and gluing together 4 or 5 of three different butterflies from the Beautiful Wings Sizzlit Die onto a piece of the stiff backing sheet from our designer series paper and embossed it onto the Pear Pizzazz cardstock. The Perfect Pennants Die has a perfect scalloped circle (in Soft Suede) to layer under our 2-1/2 inch circle punch. Add a little Pool Party sponging, the gorgeous matching Pool Party 3/8" ruffled ribbon and 3 sets of twin pearls, and you're finished. Quick and easy.